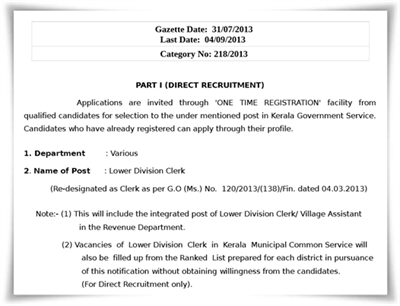 The Kerala Public Service Commission (Kerala PSC), one of the largest recruiting agency in India has decided to publish the rank list of Lower Division Clerk (LDC) next year as the current list come to an end by 2015. Kerala PSC LDC (LD Clerk) exam rank list 2014 -2015 category No: 218/2013 for all districts (Thiruvananthapuram, Kollam, Pathanamthitta, Alappuzha, Kottayam, Idukki, Ernakulam,Palakkad, Thrissur, Malappuram, Kozhikkode, Wayanad, Kannur and Kasaragod) will be published on 30th March 2015 as the validity of the current rank LDC list come to an end by 31st March 2015 March 31. The new list which is to be published on 30th March will give opportunity for those who make their name in the top slot. Candidates from 14 districts had attended the exam, the valuation of the papers is currently progressing in full swing. The final rank list would be published only based on the marks while the verification of the certificates of the selected candidates will be made later. The normal interview which is being conducted in the later stage would not be carried out for LDC exam. The Lower Division Clerk exam conducted in 7 phases from 9th November 2013 to 22nd February 2014 was attended by 16 lakhs candidates. Along with the main rank list and supplementary list, a special list for Physically Challenged candidates is also expected to get published at the official website of Kerala PSC. With a pay scale of Rs 9940 – 16580, the list of selected candidates published by the PSC shall remain in force for a minimum period of one year. 3% of the vacancies reported shall be reserved for appointment of physically disabled persons. The upcoming rank list would open doors for a number of youngsters who had been carrying dreams to get a job with the Kerala government.